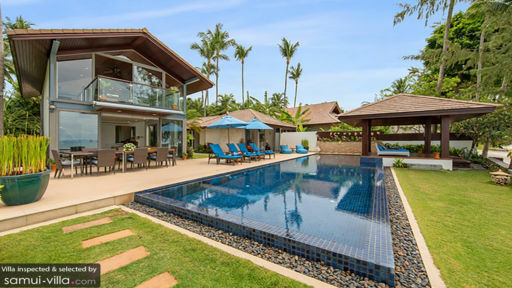 Villa Akuvara is an oceanfront vacation compound that’s comprised of about six pavilions – all typifying contemporary tropical design. Interiors are appointed with mostly finely finished and woven wood furnishings and fixtures. At the same time, amenities are deliberately first class – for the all-out delight and enjoyment of each and every guest. 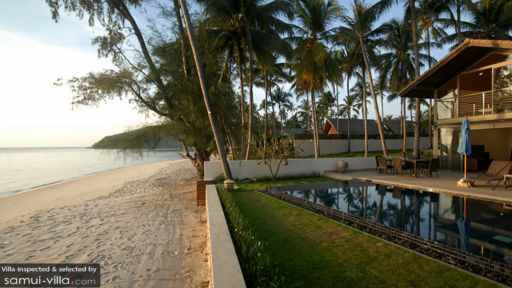 Villa Akuvara, truly, opens up for you seaside vacation living with a faraway mood. The villa has four air-conditioned bedrooms in individual pavilions. The master bedroom has a king-sized bed, as well as a dedicated, semi-open bathroom with a rain shower and an outdoor, fitted bathtub. The master bedroom has direct access to the swimming pool. Two guest rooms also have king-sized beds, although one other guest room has twin beds. All guest rooms have dedicated bathrooms with rain showers. One guest room, however, also has a kitchenette, a breakfast counter and a scenic balcony. The other two guest rooms open out to the garden. Slightly elevated from beach level, the property’s exterior is almost entirely devoted to the 20-meter infinity pool. After your morning dip in the bay, somersault into the swimming pool’s inviting, crystal clear fresh waters and continue your communion with your favorite element. For some sun, you can laze on cushioned, woven wood pool beds partially covered by large umbrellas on the poolside stone deck. But as soon as the rays begin to burn, retreat to the shade of the poolside sala and drift off to sleep on cushioned, woven wood day beds – lulled by the calming song of the waves flowing to shore. On the sunny and airy ground floor of the villa’s central pavilion is the living area with its long, angled, cushioned, woven wood couches. Here, you can all hang out for lively interaction. There are two dining areas. The indoor dining area – with its timber wood table for eight – is in a dining pavilion behind the central pavilion. The alfresco dining area – with its slatted wood table also for eight – is out on the poolside stone deck. Whichever you prefer to dine at, you can all have your fill of authentic local specialties – as well as Western staples – freshly cooked by the onsite chef at the villa’s fully-equipped, ultra-modern kitchen. At the back of the central pavilion’s ground floor is a TV lounge where you can anticipate the new episode of the latest blockbuster series. Or watch, for the nth instance, your all-time, favorite classic movie. On the central pavilion’s second floor is a study where you can spend some me time. This study opens out to a balcony with magnificent views of the beach and the Gulf Of Siam. Assigned to attend to the villa’s daily services is a well-trained and efficient staff headed by a manager backed by a chef, a pool attendant, a gardener, as well as by housekeepers and security personnel. Upon your request, a babysitter and a spa therapist may be called in. Their services will be charged separately however. Car rental is also available. 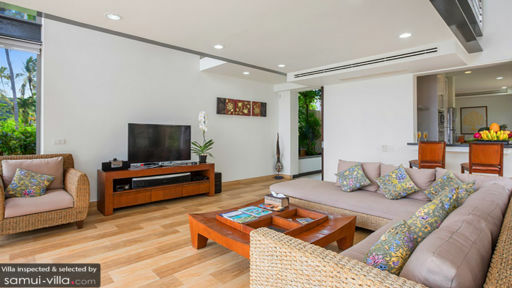 Villa Akuvara is located along Lipa Noi Beach. Aside from swimming, you can also spend the day snorkeling. Stroll along the fine, white sand stretch – especially in the evenings – and get to see traditional dances and acrobatics. A standout dining spot in close proximity to the villa is Big John Seafood.